Few scents are as stunning and delicate as Rose Oil, and its benefits – both therapeutic and anti-ageing – are just as impressive. I love to use beauty products that contain rose (and so does my boyfriend! 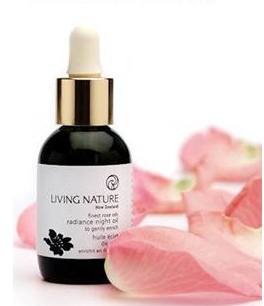 ), and this week I discovered a wonderful night oil called Living Nature Radiance Night Oil, from New Zealand brand Living Nature, that is really worth writing about. Its main ingredient is rosehip oil, which helps to restore youthful skin vitality and has a dramatic effect assisting cell renewal (it’s scientifically proven to stimulate structural skin cells up to 43 percent in 72 hours to increase the production of collagen and elastin) and it also contains essential rose oil (65,000 perfect rosebuds are distilled to create just 1ml of Radiance Night Oil to be precise!). And because of the rose oil, this luxurious anti-ageing serum, not only aids your skin’s healing properties but will also help you sleep better. It contains Rose Petals as well as Calendula, Jojoba, Rosehip, Frankincense, and the powerful antioxidants Vitamins A and E, to help rejuvenate your skin while you sleep. Lightweight and easily absorbed, you only need to use a few drops each night to achieve a healthier-looking and more radiant complexion. Rose Oil, the essential oil extracted from one of the world’s most beautiful flowers, also provides important beautifying effects on the skin. A special combination of over 300 nutrients, Rose Oil provides powerful therapeutic and anti-ageing benefits to our skin, helping to stimulate collagen production and increase elastin levels for skin that feels firmer and looks younger. Living Nature’s Radiance Night Oil contains no genetically modified ingredients, only botanicals that are sourced from sustainable sources and is not tested on animals. Radiance Night Oil retails at £48 for 10ml. For more information go to Livingnature.com. This entry was posted in Scents, Skincare and tagged anti ageing, deep sleep, Living Nature Radiance Night Oil, new Zealand, organic, relaxing, rsehip oil, youthful. Bookmark the permalink.